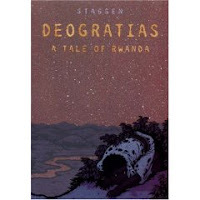 Deogratias: A Tale Of Rwanda by J.P. Stassen. Copy donated by publisher, First Second; Cybils long list. Graphic Novel. One of my Best Books of 2006. The Plot: A historical note at the front explains that Deogratias is set in late 1994, early 1995, in Rwanda, and gives background about the Hutu majority and Tutsi minority of Rwanda. This is a work of fiction; it is the story of Deogratias, a teenage boy who is a Hutu; and two teenage sisters who are Tutsi, Apollinaria and Benina. It begins after the Rwandan Genocide (800,00 to 1,000,000 dead); and has characters from all sides, the Hutus, the Tutsis, the observers, those who acted and those who did not. The Good: A must read. Stassen accomplishes much with few pages (less than 80!) and few words. He tells of life before and after the Genocide; he includes the various factions and entities present, from the UN peacekeeping force to the Rwandan Patriotic Front to the Interahamwe. The brevity helps; too many words would drown this story. The simplicity emphasizes the horror. There is a mounting sense of dread in this book; Deogratias is alive, obviously affected by the events that unfolded, but just how badly he has been injured is not known until the last pages. How did he get to where he is? And why is he so shattered, when he was not part of the ethnic group that was targeted for extermination? And what happened to those two sisters? With each page, there are glimpses of just how bad it will get, and little bits of hope to hang onto. What happens to a person who lives thru such horror? What is moral? And of course -- what would you do? This is an incredible chilling and powerful story; not only because it is about such a horrific time, but also because Deogratias's personal story is so tragic. What would someone do, at that time, in that place? You will remember these people and this story for a long time. *For some reason, lately, when I've been reading graphic novels one of the questions I've asked myself is, "did this have to be told in a GN format?" Why use pictures instead of words? Deogratias is one of those books that would not have worked half so well without the illustrations; something would have been lost if only words had been used. The film Hotel Rwanda, based on true events. Reading YA: Readers Rant review. Bookslut In Training review, from column Kids At War. Chasing Ray loved this book, also, and like me wonders, where are the awards for this book? The Rwandan Genocide happened over a decade ago. What about events going on today? Darfur Eyewitness (from the United States Holocaust Memorial Museum). I totally agree with you - I have read an adult novel on this subject - LEFT TO TELL - and it left me so "changed" after I read it - those are the kinds of books we need to read once in awhile!! Oh my goodness! I was going to mention Left To Tell, also. Talk about a stirring memoir recounting humanity's potential for evil as well as a tribute to our capacity for forgiveness! I'll be posting a review soon about this fantastic YA read, and will look forward to reading Deogratia as well. Thanks for the links related to Darfur; I was thinking of a post along the same lines today, so I'll just link over here shortly.